Successfully Added Professional Component Video Cable - 1.5m (5ft) to your Shopping Cart. As the universal analog video signal standard for home theater and high-definition television, component video cable is the only common consumer analog signal type which supports progressive scan and high-definition resolutions, enabling it to become the standard output format of DVD players. Component video cables are needed in almost every home theater setup. Component video has the convenience of being able to be displayed at any resolution, unlike composite and s-video which are 480i formats. As a result of having the color signal split three ways (luminance and two color-difference signals), component video also provides the best color reproduction ensuring clear, vibrant colors for your video. These component video cables are produced using tough, broadcast-quality raw cable to give you the very best in cable performance. Broadcast-quality cable, of course, won't do its best work if it's not well-joined to quality connectors. 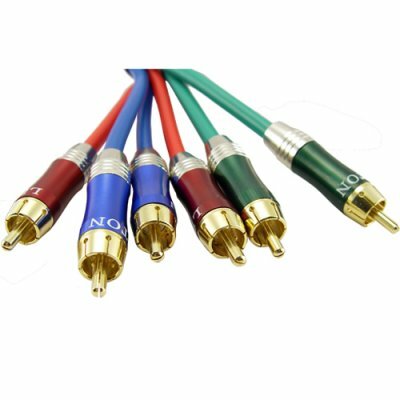 These Premium Component Video Cables come fitted with high performance, high durability RCA plugs that are top quality terminations for component video cables. With an all-metal plug body, you can be confident of superb electrical contact. The contact surfaces are also gold-plated providing a perfect, fully mechanically solid and electrically sound contact every time. These are top-performing, videophile-grade cables, but at a cost lower than many lesser cables go for in the big chain stores. So why not order now at a low, factory direct price from the leader in the coolest electronic gadgets - Chinavasion. Premium quality, 1.5m long component video cable for today's high definition, high performance electronics.